In high school, I once played the drums for a school pep assembly. We did The Who's "Baba O'Riley" and featured two of our teachers--one on vocals and one on a fiddle for the epic finale. During that finale, I did my best to channel Pete Moon's frenetic drumming style, slamming my sticks into toms and cymbals with such fervor that I didn't notice I had split open my knuckles on the metal rim of the floor tom. By the end of the song, my drums and I were covered in blood and sweat and glory. My 1960s green sparkle Ludwig drum kit still has some of the spatter. Needless to say, I love drumming. I also love movies. Whiplash is a great film featuring drumming, but it's about so much more: discipline, passion, creativity, pedagogy, and the sacrifice of one's humanity for one's artistic endeavors. Damien Chazelle's frenetic film opens with a long, slow shot of Andrew (Miles Teller) as he practices his rudiments. Slowly building in tempo, he pounds the sticks on the snare drum while the camera moves forward at a steady pace, keeping rhythm with the drumming. Steadily, Andrew picks up the tempo, sticks hitting the head with quicker rhythm, muscles taut with fervor. The drum roll builds and builds into a frenzy, only to be interrupted by the presence of Fletcher (J.K. Simmons) the renowned instructor at the elite New York music school where Andrew attends. Fletcher sizes up Andrew, asks him to play, then quickly disappears, leaving Andrew disappointed in his wake. 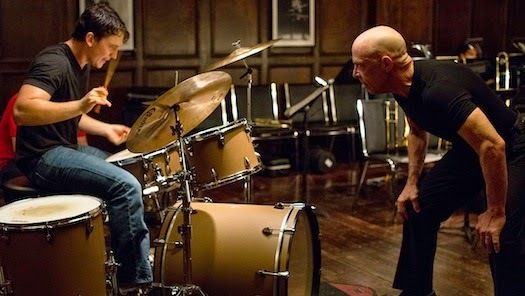 Without going too far into spoiler territory, I will say that the finale of Whiplash offers a powerful parallel moment between the two men as Andrew once again slows his drum roll to a near halt, only to pick up the tempo once more. This time, Fletcher is not going to walk out on Andrew. The stakes are much higher and the location isn't a practice room--it's a concert hall. The end of Whiplash is one of the more exhilarating moments I've had at the movies, with heart-pounding performances filled with rhythm and clash that rise to a riveting and cathartic climax. It's the best jazz and drumming movie of the year--yes, even better than Birdman--and it landed at #6 on my favorite films of 2014. Andrew does find his place in Fletcher's jazz band, but it's not without consequence and difficulty. Fletcher pushes his students hard. Wit his slim black attire, muscular arms, and fiery demeanor, he is not a man you want to annoy. Andrew only wants to impress Fletcher, to show him that he is truly The Best Drummer. 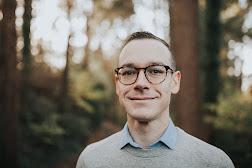 Citing Buddy Rich as his influence, he is willing to sacrifice everything--romance, friendship, even his own physical well-being--for the sake of the music. It's this sort of absolute devotion to the craft that draws these two men together. The mentor has found a willing apprentice, one who is just as merciless at his core. "There are no two words in the English language more harmful than 'good job.'" In some ways, I have to agree with Fletcher. There is something admirable about a life marked by honesty and discipline. Fletcher is nothing if not a man of principle, and he sticks to them, depraved as they might be. By sticking with his principles as a teacher, he puts his philosophy into practice, and is clearly successful in gaining excellence in his band. I know that I'm a better man for having learned particular disciplines as a drummer, but also as a husband, a father, and a pastor. If we ignore blatant flaws for the sake of propriety or "being nice," we may actually cause more harm to others than good. Fletcher calls it how he sees it, even if he's horrendous in how he goes about it. I suppose I would rather be considered "mean and loving" than nice and duplicitous. Yet alongside discipline and honesty, there must be room for the rhythm of grace. It's only by grace that we find ourselves truly whole as human beings. There will always be missed notes, off tempos, and forgotten music charts in our messy lives. To dismiss grace is to dismiss what makes us human. Both Fletcher and Andrew miss this key characteristic--grace--and in doing so, they sacrifice their humanity on the altar of artistry, not realizing that they are their best creative selves when they are their human selves. We were meant to be creative, bearing the image of the Creator. Our creativity might cost us in blood, sweat, and tears, but it should never drive us to lose our souls. When we bring grace and discipline into a steady cadence, we can be our full selves, alive to the creativity waiting to be unleashed.